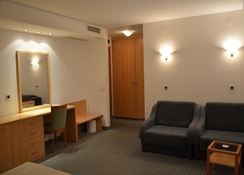 Picture a peaceful, parkland setting of pinewoods and palm trees with a pebble beach just 70m away reached by a leisurely walk along a path through the adjoining park.This small hotel?s unique feature is its very spacious bedrooms, probably the largest of any hotel in the Porec area. The sea is clear and warm and the gently-sloping beach is ideal for children.The hotel have a modern design ,it is beautifuly decorated with light colors with a touch of the typical mediterranean style. There is a tennis court near the hotel for the tennis lovers. The old town of Porec and its many shops, bars and good restaurants is a pleasant 5 minutes walk along the seaside promenade with its pretty marinas and tree-lined avenues. Beside the pedestrian seashore promenade with regular tourist train ride along the coast, the hotel offers a relaxed stay in its own peaceful and well tended lawned grounds with nearby stone pebble beach under 100m walk along the tree shaded shoreline.Porec is a town of pleasant sun and warm sea, as well as town of many cultural monuments (Euphrasius Basilica from VI st century, The temple of Neptun, Romanesque house and many others. ).And as a typical mediterranean place, It is also a town of good wine, ham, cheese, olive oil and more then 70 sports activities. 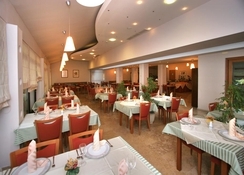 All the bedrooms have pleasant parkland or garden views and a nice balcony.The guest can delight thenselves with a beautiful view every morning while enjoy a typical breakfast at the cosy balcony.The rooms are tastefully decorated with light colors on a typical mediterranean style.They are well furnished with moderns facilities to make the guest as confortable as possible. 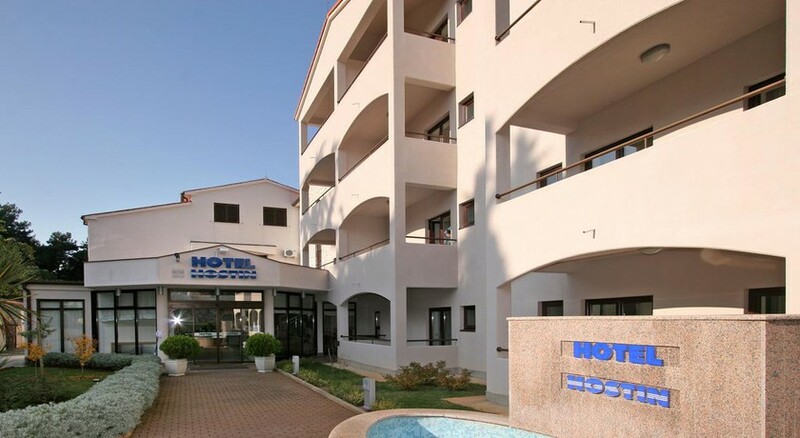 The hotel is located approximately 60km from Pula airport.Taxis are available for hire outside the building next to the bus terminal. Pula taxi drivers are honest but please check the price of the journey before engaging in order to avoid any problem.At the airport the guest can also rent a car at the low level.To reach the hotel from the airport just take the road nº66 (yellow line) direction Rovinj/Porec.Once at Porec area just follow the hotel signs.It will take approximately one hour drive from the airport to the hotel.